New Bike and the chain is too loose, i think? Question for the mechanically inclined. I have a new bike, less than 50km on it, and recent posts about wheel alignment and such got me looking at my chain and alignment. I'm not sure if the play in the chain is ok. At rest, the chain is resting on the rubber chain guide on the top of the swing arm. Underneath, the measurement is just at 58mm at point A. The owner's manual says ideal play in the chain is 51mm - 56mm. I'm having trouble determining where the measurement should be based on the picture in the manual. It could be just over, or very over. 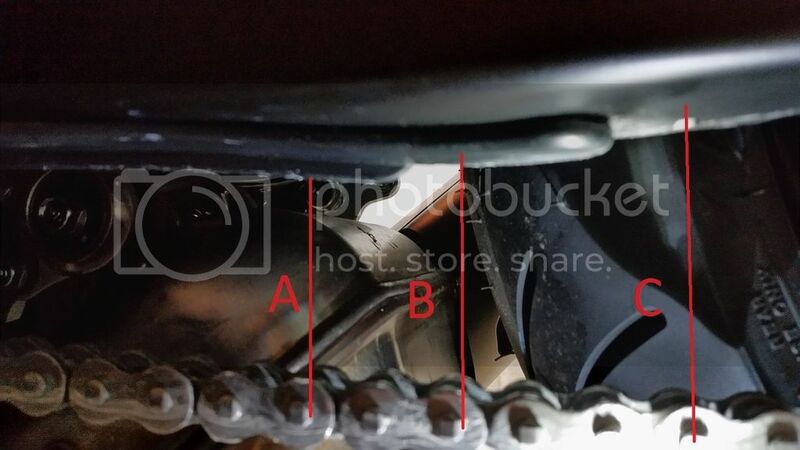 There is a rubber chain guide under the swingarm and it could throw off the measurement based on where you take the reading. Is it A, B, or C? Good question, I was curious about this too. In accordance with the manual, it is to be measured from the center of the link to point A. Thanks. I think I was pushing down on the chain too much. Your quote of the 3.0 lbf made me reconsider how much tension I was putting on the chain. Also, by moving to the end of the guide, like you said, between A and B in the pic, it came in at a happy 55mm.